In follow-up to yesterday’s Bowman IQ test, I thought I’d further explain my utmost contempt for the Bowman brand. Harsh words, eh? Maybe. True, some of the Bowman issues are pretty slick. For instance, I think the 2010 release is pleasing to the eye, and the 2012 flagship is top notch in my book. However, most years either: look alike; are remarkably forgettable; have been touched by the hand of Satan himself; or all of the above. For example, a few weeks ago, I thought I had all of my Bowman cards organized sequentially, neatly stored in their 3,000 count boxes with labeled dividers. Through luck or happenstance, I managed to decipher the Bowman (#), Bowman Draft Picks and Prospects (BDPP#) and Bowman Prospects (BP#) puzzle. On top of that minor miracle, I even had enough wits to notice that the thick cards were “Gold” versions and not part of the base set. So, I’m doing great, right? That’s what I thought. Turns out a few nights ago, I found a Bowman card hiding on one of my shelves. No problem! I’ll just consult my clipboard, find out which box this card belongs in, and were done! Thinking it might be an error or one of those dastardly annoying variations/super short prints, I consulted the Internet and the next words out of my somewhat resembled “Gawddamsumabitch.” It’s wasn’t a variation. 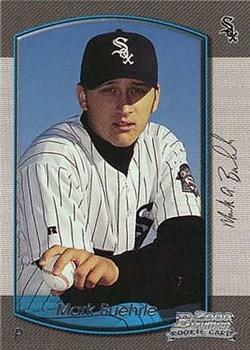 The database clearly said that card #69 was Javy Lopez, but I was holding Mark Buerhle’s card numbered 69 in my hand. 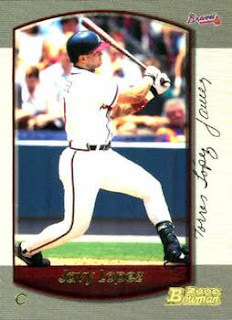 After about 30 minutes of sleuthing, just to put ONE card in the correct location, I found out that Topps used the exact same design AND numbering system for two different sets in 2000. One being the 2000 Bowman base and the other being the 2000 Bowman Draft set. Who in their right mind does this? I then had to go through all of my 2000 Bowman and try and figure out if a card belonged in the Base category or the Draft set category. Talk about First World Problems. That took another 30 minutes, and then I was finally done. Or so I thought. Next I just started leafing through the cards to see if there were any other anomalies. Everything was a-ok until I got into the Bowman Chrome cards. Flipping through them I noticed that several of the cards had a slightly different shine to them than the others. I then looked at the back of the cards and saw nothing different. Puzzled, I looked again and found the tiniest word difference on the back. I’m sure you know what it was. It said, "refractor." Surprisingly, I didn't get many responses. I guess people just don't give enough of a crap about Bowman to even read it! I'm a Bowman apologist, so I cannot really say anything bad. For organizing old sets, I can see the issues. However, Bowman Flagship comes out in Spring now, while Draft comes out in Fall. That extra time probably helps for constructing and numbering sets nowadays. You could have saved yourself hours of work and cursing and just sent me that Buerhle. I'm right there with you. I got so frustrated trying to figure Bowman out that I now have a box with quite a bit of unsorted Bowman. It's maddening.